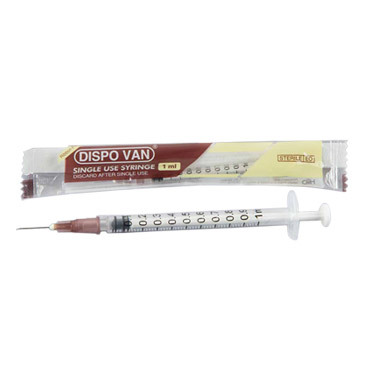 DispoVan & Unolok - Hindustan Syringes & Medical Devices Ltd.
“Ribbon” Packed, Dispovan & Unolok Single use tuberculin syringes without needles and with needles mounted on top. 1ml Tuberculin syringes are long type syringe with 26 Gx 1/2 needle on any other needle size as per the requirement. These syringes are used to give BCG Vaccination. Barrels & Plungers are made of nontoxic, medical-grade polypropylene compatible with the medication for short term contact drug delivery application. The nozzle of the Barrels is luermount type having a 6% luer taper as per ISO:594. Packing DISPOVAN and UNOLOK Single use syringes are individually RIBBON PACKED in a double-laminated plastic film.Ribbon packaging is superior to blister packaging due to higher puncture and water resistance, enabling extended shelf-life under adverse conditions. But for better container loadability we are also making transparent thermoformed peel able Blister pack. opened or damaged then do not use.